1. How do residential wind turbines work? In a standard residential application, a home is served simultaneously by the wind turbine and a local utility. If the wind speeds are below cut-in speed (7-10 mph) there will be no output from the turbine and all of the needed power is purchased from the utility. As wind speeds increase, turbine output increases and the amount of power purchased from the utility is proportionately decreased. When the turbine produces more power than the house needs, the extra electricity is sold to the utility. All of this is done automatically. There are no batteries in a modern residential wind system. Small wind systems for remote applications operate somewhat differently. 2. Will a small wind turbine save me money? The wind turbine typically lowers your electricity bill by 50 to 90 percent. It is not uncommon for wind turbine owners with total-electric homes to have monthly utility bills of only $8 to $15 for nine months of the year. In northern parts of the country where less air conditioning is used the bills can be very low year-round. The amount of money a small wind turbine saves you, in the long run, will depend upon its cost, the amount of electricity you use, the average wind speed at your site, and other factors. 3. What size turbine would I need for my home? Homes use approximately 9,400 kilowatt-hours (kWh) of electricity per year (about 780 kWh per month). Depending upon the average wind speed in the area, a wind turbine rated in the range of 5 to 15 kilowatts would be required to make a significant contribution to meet this demand. 4. Who should consider buying a wind turbine? 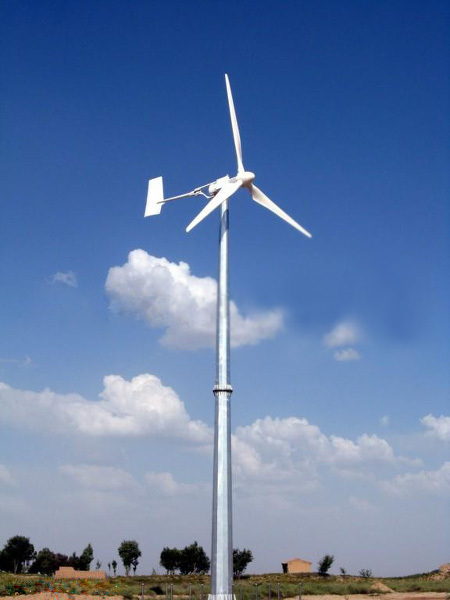 A residential wind turbine can be a relatively large device and is not suitable for urban or small-lot suburban homes. Except for very small wind turbines (i.e., with rotors one meter or less in diameter) on very small towers, a property size of one acre or more is desirable. The economics of a wind system are very sensitive to the average wind speed in the area, and to a lesser extent, the cost of purchasing electricity. As a general rule of thumb, if economics is a concern, a turbine owner should have at least a ten mph average wind speed and be paying at least 10 cents/kWh for electricity. Residential wind turbines have been installed in at least 47 of the 50 states, but the majority of the units have been installed in the Northeast and the Midwest. 5. Will it help the environment if I install a wind turbine at my home? Yes. Wind turbines produce no pollution and by using wind power you will be offsetting pollution that would have been generated by your utility company. Over its life, a small residential wind turbine can offset approximately 1.2 tons of air pollutants and 200 tons of greenhouse gasses (carbon dioxide and other gasses which cause climate change). 6. Don’t I have to take wind measurements for a year or more? For most residential systems, the cost of taking wind measurements is not justified. Wind resource data published by the Department of Energy is sufficient for an experienced evaluator to predict wind turbine performance. In very hilly or mountainous areas, however, it may be best to collect wind data before purchasing a system to ensure that your site is not in a sheltered area. 7. Do wind turbines make noise or interfere with TV reception? Small wind turbines do make some noise, but not enough to be found objectionable by most people. A typical residential wind system makes less noise than the average washing machine. Wind turbines do not interfere with TV reception. 8. Will my utility allow me to hook up a wind generator? Federal regulations require utilities to connect with and purchase power from small (less than 80 MW) wind energy systems. A wind turbine manufacturer should be able to help arrange the required utility company approvals. 9. Will I have to change any of the wirings in my house? No. A wind turbine is easily retrofitted to virtually any home without the need to change any wiring or appliances. In most cases, the utility will install a second utility meter to measure how much surplus electricity it is purchasing from the turbine owner. An 80- to 120-foot tower is usually supplied along with the wind turbine. Towers this tall are necessary to raise the wind turbine above turbulence generated by obstacles on the ground and trees. Wind velocity and, therefore, wind turbine performance, increases with altitude. Several different types of towers are available, depending upon which manufacturer you select. Each type has its advantages; the most economical type of tower is the guyed lattice tower, but a hinged tower can be easier for you to install yourself and provides easier access for maintenance. 11. How much does a wind system cost? A small turbine can cost anywhere from $6,000 to $22,000 installed, depending upon size, application and service agreements with the manufacturer. 12. How reliable are wind turbines? Will I have to perform much maintenance? 13. How do wind turbines perform as an investment? The wind system will usually recoup its investment through utility savings within six to 15 years and after that the electricity it produces will be virtually free. Over the long term, a wind turbine is a good investment because a well-sited wind system increases property value, similar to any other home improvement. Many people buy wind systems in preparation for their retirement because they don’t want to be subject to unpredictable increases in utility rates. 16. How would I have a wind turbine installed at my home? Most dealers offer either complete turnkey (ready-to-operate) installations or the option to purchase direct from the factory and install the system yourself. The first option offers more customer support from the company. Self-installation offers significant savings and a hands-on understanding of the turbine. Prospective owners can discuss the options available with manufacturers to decide which method best suits their budget and technical skills. For More On Wind Power Click Here!